A newly discovered plastic-eating bacterium may hold the key to safely degrading millions of tonnes of polyethylene terephthalate (PET) plastics dumped each year… Scientists have long searched for a biological agent that could effectively degrade PET’s tough crystalline structure. To date, they had only found a few species of fungi that could partially break down the plastic. But a team of Japanese researchers, led by Dr Shosuke Yoshida from the Kyoto Institute of Technology, have discovered a new species of bacteria that produces a never-before-seen plastic-eating enzyme. China aims to keep energy consumption within 5 billion metric tons of standard coal equivalent by 2020, it said in its five-year plan, marking the first time the world’s second-biggest economy has set such a target. China has long been considering an energy consumption cap in a bid to improve industrial efficiency, tackle smog and control greenhouse gas emissions, which are the highest in the world. Beijing is also pushing structural reforms to decouple economic growth from energy consumption. As the climate heats up, the forecast is also calling for more rain. Think downpours. Cats and dogs. Or just “extreme rain”, as the scientists call it. The overall rain and snowfall average is increasing only moderately. But observations since 1951 show the wettest days every year have built up their intensity by 1 per cent to 2 per cent per decade, according to a study published this week in the journal Nature Climate Change. NEW ZEALAND – One-time ocean foes have banded together to send a private letter to the government slamming “flawed” plans to overhaul marine reserves. But Environment Minister Dr Nick Smith has hit back, accusing commercial fishing interests of undercutting a million recreational fishers. A dozen groups from fisheries companies Sealord and Sanfords, to Forest and Bird have signed the letter, obtained by The Dominion Post, criticising the Marine Protected Areas Act. AUSTRALIA – A giant panda snail is the latest in an increasing number of live creatures being illegally sent to Tasmania using Australia Post’s express post service… In recent weeks, Biosecurity Tasmania staff have detected and seized live fish and plant material containing ants arriving by mail. “Live fish and live coral is getting more and more common, it’s so easy for people to purchase things online and not aware of the what the requirements are,” Mr Paul said. UK – Planting trees around rivers could reduce the height of flooding in towns by up to 20%, new research suggests. A study for the Environment Agency concludes that trees round a feeder stream can slow the rush of rainwater and save properties from flooding. But it warns that natural flood prevention methods do not always work. NEW ZEALAND – A bottle of dirty water sits on the front porch of one Wairoa couple’s home. Months ago it was collected by farmers Jamie Seymour and James Jarden when the Waihi Dam began spilling silt into three northern Hawke’s Bay rivers. When shaken the heavy sediment takes minutes to settle, while the rest of the water remains cloudy and brown, like a dirty snow globe. A recent article in Nature highlighted that most federal and state biodiversity conservation policy fails to recognise biodiversity as a major source of industrial products. Much as explorers chart new territories, chemists, materials scientists, engineers and biologists are exploring biodiversity for medicine, agricultural and industrial products. This sits well with Australia’s current focus on innovation, driven by Prime Minister Malcolm Turnbull. But the potential of biodiversity has been overlooked. The Financial Stability Board’s Task Force on Climate-Related Financial Disclosures held its first plenary meeting in Asia on 9 March in Singapore. Bloomberg New Energy Finance delivered the following presentation, on clean energy in Asia and energy transition risks for commodities and the utility business model, at the Singapore Exchange. The Obama administration’s decision to crack down on the methane leaking from nearly 1 million oil and gas wells across the country promises to reduce greenhouse gases but also imposes new costs on an industry that’s already reeling… Environmentalists cheered the approach, saying the focus on methane delivers big bang for the buck, with a more immediate climate payoff than slashing carbon dioxide from power plants. But industry leaders cried foul, saying new methane rules could quash domestic drilling, heaping more pain on energy companies that have idled more than 1,000 rigs and gutted more than 250,000 jobs since oil and gas prices started falling in 2014. ‘Forced labour affects roughly 21 million people around the globe, of whom 68% are exploited for private economic gain.’ These chastening figures, produced by the International Labour Organisation, are spurring governments around the world to bring in tough new measures to deal with this $150 billion industry. AUSTRALIA – The Clean Energy Council has outlined new rules and standards that will allow it to delist rooftop solar modules and inverter products that fail to meet safety and performance standards, or do not deliver on marketing and warranty claims. Spot NZUs gained another 5.5% this week to close Friday at NZ$10.60 ($7.10) in a rally driven by compliance buyers expecting the government to introduce tougher rules. The allowances broke through the NZ$10 level last week for the first time since Dec. 2011, and rose another 55 cents this week. One lot of 50,000 went through on Carbon Match at NZ$10.75, though the price settled at NZ$10.60. The other night I went to the supermarket to pick up a few things for dinner. Eggplant was a key ingredient for the salad but I couldn’t see them anywhere. I spent ages looking up and down the aisles and was starting to rethink the dinner option when I saw them. No wonder I missed them – instead of sitting there, gleaming and luscious in all their purple aubergineness, they were in a plastic bag. Not only that – they were in a plastic tray in a plastic bag. 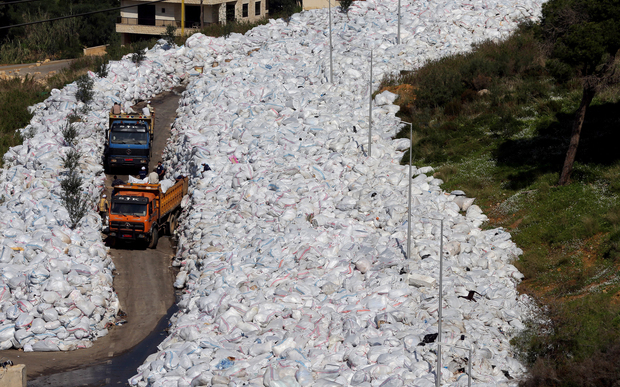 Lebanon is to temporarily reopen a landfill site and set up two new sites in a bid to end an eight-month crisis over uncollected rubbish in Beirut. Piles of rotting refuse in the city’s streets have prompted a mass anti-government movement. Many of us instinctively appreciate that being connected to other people is one of our most basic human needs… And, too often, that experience of feeling like we don’t belong has broader repercussions. It undermines people’s identity and dignity. It deprives them of their agency and voice. AUSTRALIA – Randy Yibarbuk is a designated future elder of his clan in the Yolgnu nation in west Arnhem Land. Before he was 10 he was sent for two years to “walk” with his father and elders, and ancestors, in the bush, learning “men’s business” – traditional ways and the skills that would help him start the deep layering of knowledge of the Earth and her ways. For several months he’s been working with Lirrwi Tourism based in Nhulunbuy in Arnhem Land’s east, where he is a guide on a relatively new tourism project that allows small groups of tourists to live for some days on traditional Yolgnu homelands. NEW ZEALAND – Sinister sharks, a translucent waka and a meeting house fashioned from recycled plastic are suspended in the air at Pataka Art + Museum. 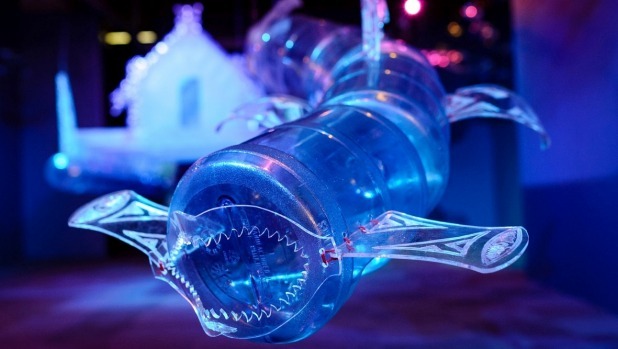 Artist George Nuku’s installation Bottled Ocean 2116 illustrates what the world might look like in a century, if plastic “permeates life on earth on every level”. George Nuku’s installation Bottled Ocean 2116 is on show at Pataka Art + Museum until April, as part of the NZ Festival. NEW ZEALAND – Neither a rap nor bible verse could sway Environment Minister Nick Smith to consider making waterways swimmable. Smith visited Palmerston North on Thursday as part the Government’s nationwide fresh water consultation, the night before a new five-year plan to clean up the Manawatu River was due to be released. An Australia-based start-up behind ground-breaking technology that allows landlords to operate like a micro-utility, by selling solar power generated at their rental property back to their tenants for less than power from the grid, has released a complementary online platform, to help the country’s 2.4 million rental properties negotiate the path to the solar market.